U.S. Kids Tour Series clubs are made from the same high-tech materials as leading brand adult equipment, including Beta forged titanium drivers, stainless steel fairway woods, hybrids, irons, and black nickel spin wedges. Now featuring V-10 clubs, which are 10% lighter than adult clubs to help kids swing with ease. For kids playing at an intermediate to advanced level with swing speeds above a specified mph for their height, Tour Series clubs are the best choice. 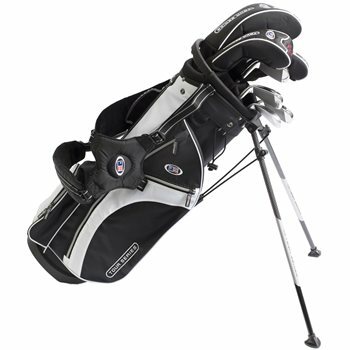 Includes: Driver, 3-wood, 4-hybrid, 5-PW, sand wedge, and stand bag. Optimal Height Range: 49.5" - 52.5"
Perfect Fit: Player Height 51" / Driver Length 34"